Loki and the Mandarin were made for the Avegners-themed update for ScrollBoss that was made around the same time Avengers hit theaters in 2012. Princess Python was quickly made for the Saturday Night Sprite topic on the Scruffy Dragon message boards in 2012 (before the site and board was rebooted), but fixed up a bit later. I've tried a few times to put scales on the light green part of the outfit, but they always look bad. The one seen in the link below is the last attempt (for now). 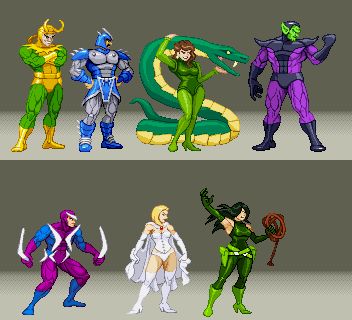 Besides, that'd be insanely cumbersome in a full sprite set. Super-Skrull was made for the 2013 Comic Book Week updates on ScrollBoss. Boomerang was for ScrollBoss' "the Revenge of 1989" event in 2014 due to his involvement in two different Marvel video games in 1989. Seriously. 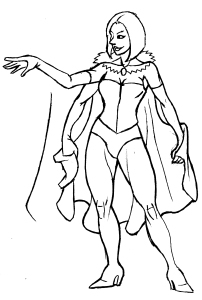 The first White Queen/Emma Frost sprite was made in 2014 for the same 1989 reasons, except it's believable that the White Queen was popular enough to appear in two games in one year. Madame Hydra/Viper sprite is based on Jim Steranko's beautiful artwork for Captain America #111, page 5.